Japan’s uber-popular clothing brand, Moussy, just launched their new Autumn/Winter 2008 campaign! 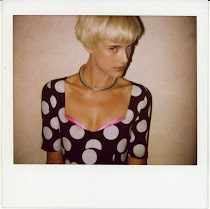 Model, It-girl, and fashion icon Agyness Deyn was featured in the ad. 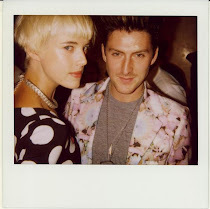 The collection is straight out of LA’s 80’s punk rock scene and seems inspired by Deyn’s own wardrobe. The 5’10” British model first made a name for herself in 2006 and has exploded onto the fashion scene ever since. During the 2007 British Fashion Awards, she was named “Model of the Year”. She’s been on every sought-after magazine cover and runway show while signing lucrative advertising deals from Burberry to Galliano to Hugo Boss. Known for her unique and quirky style, cropped bleach blond hair, and Madonna-esq dark brows, this model-of-the-moment is being heralded as the next Kate Moss. As you know those are big shoes to fill and I’m not so sure that any other model can pull it off. On the other hand, if anyone could do it, it might just be Agyness. Her androgynous physic and daring personal taste is a refreshing change from the Gisele’s of the world. I love Gisele, and she’s stunning but Agyness has that j'ai ne sais pas quoi that elevates her to a different level. I can’t wait to see what else this hipster-fashionista accomplishes, and I’ll definitely be keeping an eye out for her on the runways during New York Fashion Week! she's really joie de vivre!